Feb 23 Day 54 - Martian Chips. Day 54 - Day 2 of Oscar fever. Who's throwing a party? More importantly, will there be food at the party? Count me in but only if there is food, especially popcorn! Movie food is special. Is it just me or do big memories get made when sitting in a dark room snarfing down boxes of candy and salty, buttery popcorn while guzzling barrels of cherry coke. Think of E.T. What comes to mind? Yep, Reese's Pieces. The Martian is the only Oscar nominated file I was able to watch this year, yet. Spoiler Alert: In the movie, the main character who is played by Matt Damon, is forced to grow his own potatoes. He then is forced to eat an ungodly amount of potatoes to stay alive. In honor of this Oscar nominated flick, today's project will be to fry up a batch of homemade potato chips, or as I like to call them "Martian Chips." These "Martian Chips" would make Oscar party worthy food. They are easy, salty and delicious. They would go great with the Oscars or any movie! Using a mandoline or a sharp knife, cut the potatoes 1/8 - 1/4 inch thick widthwise. 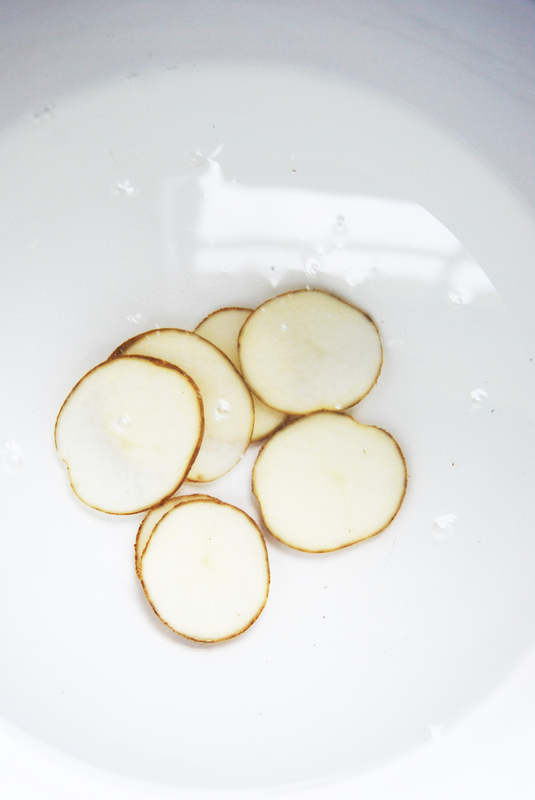 Place the potato rounds in a large bowl with cold water and let soak for 30 min to remove excess starch. Drain the potato rounds and pat dry and place on paper towel to remove excess water. Heat canola oil in a dutch oven on the stove over medium high heat. Once the oil is hot, place 8-9 potato rounds in the canola oil until evenly golden and crispy, about 3-4 minutes. Remove potato rounds from the oil and place on a paper towel lined plate. Sprinkle with sea salt to desired taste. For The Record, These Are Way Too Crispy. Now, all we need is some ketchup. Oscar night here we come! What do you think? Will you be serving Martian Chips at your Oscar bash? Feb 24 Day 55 - Glam Squad. Feb 22 Day 53 - Oscar Fever.